Public Access stations are important to members of the community because they provide a forum to all. The key to our success is the public interest and the involvement of residents in the community. Whether you’re interested in television production, hosting your own radio show, or just expanding your knowledge and skills with contemporary media and cutting edge technology, FPA will provide you with access to the tools you need in pursuing your goals. Class registration is available for all active FPA members. Our courses vary in length from a single 3-hour session to workshops lasting 10 sessions. Prices range from $35 to $500 dollars. However, most are in the $100 to $300 range. For more information or to register for a class please contact the Training Department at 571.749.1102 or at jerausquin@fcac.org. For information regarding registration policies and procedures, please check the Training F.A.Q. section. In this workshop you will learn the basics of digital recording, audio editing, and processing -as well as mixing voice with sound effects and music- using the industry standard Adobe Audition CC program. The class is designed to teach the necessary skills to edit radio shows or creating audio promos. Furthermore, you'll gain an understanding on how to prepare audio files for podcasting or web purposes. Upon completion of this course, use of this equipment is authorized for volunteer purposes or for those working on their own approved FPA program. We highly recommend beginner students take our Radio Production course first to learn all the capabilities available in our Radio Fairfax and WRLD Radio studios prior to registering in this class. Student prerequisite: FPA membership, orientation & knowledge of computer concepts. Prerequisite: Orientation & knowledge of basic computer concepts. Adobe Premiere is a real-time computer video editing software application applicable to both the beginner enthusiast and those working in the professional field. Our Adobe Premiere class has been designed for new students in mind in order to teach them the essential editing techniques and functions of this program. Some of the items that will be covered in the class include the basics of capturing video/audio, project management, trimming sequences, video generating, creating titles, and final outputting, including laying back to videotape. Note: some class time will be dedicated to review the FPA computer lab rules and procedures. Certification requires the completion of class project. Audacity is a free software program that will let you edit your audio files quickly (available for both PC’s or MAC’s). During this 3 hour audio editing workshop, you will learn to develop your audio abilities by editing audio files, mixing music, voice, and sound effects while learning the operations of this easy-to-use multitrack editor. You will also learn how to apply special effects such as reverb, echo, and frequency equalization. This program can be downloaded from www.audacityteam.org. Students will need to have an external storage device such as a flash drive to save the class project. Pre-requisites: Orientation & knowledge of basic Computer concepts. Avid Media Composer 8 provides students with exposure to the core skills, workflows, and concepts involved in using this high-end professional non-linear video editing program. It covers the layouts and interface, mixing frame rates and aspect ratios, importing and project management. Sessions are divided between demonstration and hands-on practice, with dedicated lab time in order to complete a short final project. For those that are interested in learning this program whether it’s for personal use, for work, or to help them in the professional field a familiarity with computers and basic knowledge of editing is recommended. *Beginners in video editing might prefer to start with our Adobe Premiere class instead. For those with a production background interested in learning FPA’s newest field equipment, this workshop teaches the essential operation features of the JVC HM600, 650 & 850 cameras. Capable of recording in either SD or HD the class is designed to teach students hands-on the use of these cameras and their related field accessories such as tripods, mics and light kits. (Beginner students interested in learning both the field camera equipment and proper field production planning procedures should consider registering in the Field Package course instead). Learn the key concepts of electronic field productions - from pre-production planning to on-site preparation - all while learning the use of the latest field television camera equipment at FPA. The class uses a mix of lectures with hands-on demonstrations to teach items such as proper camerawork, lighting, and audio recording techniques. This is a key course for those FPA students interested in using FPA field equipment to produce a show outside a formal television studio in order to record field interviews and/or documentary style projects. Upon completion, students are certified in the use of FPA's field camera equipment and accessories. Use of this equipment is authorized for volunteer purposes or for those working on their own approved FPA program. For those interested in producing their own television shows using our facilities and/or equipment, this 6-hour class teaches the participants the pre-production, production and post-production responsibilities of an FPA TV Producer. The class covers all key policies and procedures, along with crew planning needs, which students need to learn and prepare for in order to successfully produce their own programs. Completion of this class is a requirement for approval of an FPA television program proposal. Certification requires passing the producer test. This course is designed to teach the basics in radio operations: operating the radio board, the use and mixing of multiple sources and the proper on-air presentation. You will also learn how to develop a 30 sec promo. You will be required to prepare a few mini-radio shows and present them live, on-air as the class progresses. Upon completion of the class students are certified as FPA Radio Producers and will be able to start show of their own. This class is designed to teach students how to operate our latest state of the art “virtual set” studio and become certified in all major technical crew positions found in studio C (Technical Director, Audio Operator, CG/Graphics and Teleprompter operator). A major component of this course is learning the operation functions of the NewTek TriCaster system and control surface. Note: The class does not include a volunteer requirement but practice and continued use of the equipment is highly recommended to improve your understanding and television production skills. Prerequisite: Studio Camera & knowledge of computer concepts. This introductory course provides hands-on training in the operation of FPA’s studio cameras. By attending this course the participant becomes proficient enough to volunteer as a camera operator on studio shows produced at FPA, and can begin to earn production experience. At the completion of the class and the one session volunteer requirement, you will be certified as a camera operator for Studios A and B. This course is a prerequisite for many of our TV Production classes. Certification requires the completion of 1 volunteer studio camera assignment. Studio Package is an all-encompassing course that provides hands-on training in all the equipment elements needed to help produce a television program using FPA’s Studio A or B. Key equipment positions covered include Camera operations, Lighting, Set-Design, Audio operations, graphics Character Generator, Chroma Key/Green Screen, Technical Directing, the basics of using the Lightworks program and proper production planning tips. If you would like to know how to create a show in Studios A or B – whether it’s a talk show, sports, news or interview segments then this is the class for you. By the end of this course you will be certified in the use of all the studio and control room equipment and authorized to volunteer in equipment positions for studio A/B productions. Note: volunteering and continued practice with the equipment is key to improve one’s skills and experience. Certification requires the completion of 1 volunteer session in a control room equipment position. After Effects is an industry standard digital-postproduction program that provides a comprehensive set of 2D and 3D tools for creating graphic animations, and effects used for broadcast television, web and other video production needs. Using the program, you can composite layers in various ways, apply and combine sophisticated visual effects to enhance a presentation, image or a particular video project. Through the use of class demonstrations and practice sessions this course is designed to teach the essential functions of this program to beginners and those with editing experience alike. Student prerequisite: FPA membership, orientation session. Knowledge of basic computer non-linear video editing is recommended. We also recommend each student to bring their own external hard-drive as part of the course. The use of Adobe Animate varies greatly depending on the goals of the user, but creating animated projects or interactive content is at the core of its function. The program is used for a wide variety of projects like websites and mobile games; however, the focus of this class will be to cover the use of this program for the goal of creating animated segments or cartoons for television and video project purposes. Student prerequisite. FPA membership. Since Adobe Animate is considered an advances course, prior Adobe experience by completing one of the following courses is advised: Premiere, After Effects, Photoshop or Illustrator. Adobe Premiere is a real-time computer video editing software application applicable to both the beginner enthusiast and those working in the professional field. Our Adobe Premiere class has been designed for new students in mind in order to teach them the essential editing techniques and functions of this program. Some of the items that will be covered in the class include importing, project management, trimming clips, creating titles, and final outputting. Note: some class time will be dedicated to review the FPA computer lab rules and procedures. This course is designed as a continuation of our Adobe Premiere course and is intended to highlight some of the more advanced features of the program. Students will learn time saving tips and ways on how to streamline their workflow. Topics that will be covered include: Advance trimming, Keyframing, video/audio filters, chroma key, plus multi camera editing. Note: Students must well versed in topics covered in level 1. Course description: Behind every great radio or TV production is great writing. This class will introduce students conducting interview style productions with tools to help them develop the best possible quality stories. Focus will be given to discussing the importance of preproduction logistics, the strategies on how to best craft the story, and how-to tips in handling the challenges that develop in the process. By working with actual examples, students will learn to write effective introductions, and interview questions for use in the studio or in the field. Student prerequisite: FPA membership, orientation sessions, plus we recommend students to be either TV or Radio FPA producers. Great looking shows must incorporate great audio to be successful. This course is designed to help achieve that by teaching fundamental ways to improve the audio quality of studio TV productions. Topics covered in the class include: understating the different types of microphones, positioning them on the set and talent, conducting the essential microphone sound checks and monitoring audio during production. Student prerequisite: FPA membership, orientation session. Certification requires the completion of 1 volunteer audio assignment. Learn about the character generator graphic system and how to prepare graphic templates for studio A and B productions. Students will be taught CG theory, file structure, graphic creation (compositions, lower third graphics, and opening / closing credit rolls), along with sequencing (creating sequences, editing sequences, & sequence shortcuts). This course allows students to become proficient enough to volunteer as character generator graphic operators in A and B studio productions. Student prerequisite: FPA membership, Studio Camera class & knowledge of basic computer concepts. Certification requires the completion of 1 volunteer CG/Teleprompter assignment. Appearance is one of the most influential factors in the audience's initial decision concerning the credibility of the performer! Learn all about the essential makeup application techniques and supplies and tools needed to help on-air talent personalities look their best. To look effective on camera, makeup application will not only enhance your production, it will give the performer the added confidence they need to help make the show a success. Refine your skills as a presenter and interviewer. Learn how to create the best "you" and the best environment for you. Maximize your on-camera impact. Learn how to present your best self, vocally and visually, and how to evaluate the set and make it work for your program objectives. Learn how to pre-interview your guests. This workshop is geared for the motivated producer interested in learning the essential elements and importance of script writing as a way to develop their television show ideas. Topics covered include conceptualizing the idea, understanding script formats' terms and concepts, and an overview of the role of script writing in the industry. Social media is a broad term and this particular workshop is designed to help our current and future producers find ways to use the multitude of available online tools to properly promote and market their program. The course will touch on items such as branding, using open web sources to create startup sites, and locating resources online to network and establish a following. Studio Lighting is a combined demonstration and lecture workshop designed to cover the proper setup and functions of the lighting grid in Studio B. Topics covered include: usage of the lighting console, planning a lighting scheme (explanation of the difference between the orange and green tape lights in our grid), the 3 point lighting system, usage of gobo accessories, plus routine safety practices. The overall goal is to improve the visual quality of shows using this studio. Note: FPA’s studio A and C have a preset lighting grid and the lights cannot be altered but they can be dimmed using the appropriate light console in those studios. Certification requires the completion of 1 volunteer lighting assignment. The affordability and expanding capabilities of DSLR cameras are leading novices and professional filmmakers alike to embrace this technology into their set of took kits. DSLR cameras allow almost anybody to operate and capture high quality photos or video but the function of these cameras are often misused or their full capabilities remain unutilized by beginners. This course will provide a thorough explanation on their function to allow students to use them like a pro. Prerequisites: FPA member, basic photography and computer experience. Recommended: Our instructor will highlight the use of DSLR cameras using FPA’s latest camera model, however, students are welcomed and encouraged to bring their own to better grasp the capabilities and maximize your own cameras’ features. Having a technical director operating the switcher is a crucial crew position to have in order to complete a successful show in either Studio A or B (for studio C please refer to the Studio C course). As part of this class students will learn how to properly operate the video switcher, become acquainted with the terminology and duties associated with this crew position, discover the group dynamics involved in working with the Director/Producer, plus understand the available options on how to record a show. This includes understanding our technical standards and acceptable video formats and the available recording equipment options in the control rooms, such as the SD recorders, the SSD reader, how to record using Lightworks and even the option on how to isolate the raw footage from each camera if needed. Prerequisite: Studio Camera & knowledge of basic computer concepts. Certification requires the completion of 1 volunteer TD assignment. In this Voiceover class, you will begin to build the skills needed to obtain greater command of your on-mic voice in order to create compelling voice-overs. By the end of the class, students will have practiced the art of cold readings and effective reading skills for voiceovers. Students will learn the art of narration, commercials, political spots and what constitutes a good demo in this fast paced class. TV101 introduces youths from ages 12 to 18 to all aspects of Television Production. As part of each camp students will work as a team to create a 30-minute TV program; therefore, we are looking for the best, most dedicated students interested to learn about this exciting media. Students will develop a script / story board idea, learn the appropriate equipment and shoot their show. As part of the TV Studio and Field Camp, the instructor will highlight how to edit the video footage but students will not learn how to edit themselves. For students interested in learning how to edit we recommend attending the TV Post-Production Camp instead. Each camp is open for students ages 12 – 18. The cost of the camp includes FPA’s annual membership fee for each student a - $26 value. We also recommend camp students to remain active for the year and volunteer in the various shows produced at FPA to apply what they learn in the camp and earn production experience. Download the Summer Camp Registration forms here. Choose between the two different camps. TV 101 Studio Camp includes instruction in pre-production, scriptwriting, teleprompter, lighting, camera, set design, on-air talent, computer graphics, technical directing and non-linear editing. Learn the basics of how to create a studio TV production and create a half-hour program that will air on Channel 10! TV 101 Field Camp: participants will get hands-on training using the JVC HD Pro field cameras and accessories while learning how to conceptualize and produce an electronic field production project. Classroom facilities will be booked for each session; however, a great deal of time will be spent outdoors gathering the footage for the show. During post-production, students will learn the basics of non-linear editing and create a half-hour program that will air on Channel 10. The TV 101 Studio and Field camp fees include a 1 year FPA membership. Students will cover 10 sessions of 4 hours each day and completion of a class project. Parent's permission required for youths between 12-18 years old. To register please contact the Training Department or mail in the appropriate camp registration and parental consent forms. Since its inception, radio has had a great impact in the culture of the world. Music, news & conversation, storytelling & humor; radio has an impact in all things and continues to do so. In our WRLD Radio Summer Camp students will write, produce, direct, edit promos, and work towards creating their very own radio show. Class time is non-traditional with a mix of workshops, in class discussions and hands-on training. During the camp, students will understand the needs of each radio show genre and review the specific requirements for each. In addition, students will know how a radio studio works, take part in workshops devoted to the use of the radio board, develop scripts for radio news, weather report, and/or produce voice-over segments. Students will also learn how to interview their peers and review the art of audio editing using Adobe Audition. During the camp, students will rotate and share key production roles as they bring these projects together and create their very own radio show. The WRLD radio camp fee includes a 1 year FPA membership. Students will cover 5 sessions of 4 hours each day & completion of a class project. To register please contact the Training Department or mail in the appropriate camp registration form and parental consent form. If you have taken prior courses at FPA (within a year or two) but life's busy schedule has kept you from using the equipment frequently our refresher and recertification workshops are ideal for students that wish to familiarize themselves with the equipment once again. Students receive a 1-on-1 hands-on review with the instructor in each of these 1-2-hour review and recertification sessions. Workshop scheduled by appointment with Training Dept. Prerequisite: Previously been certified in either Final Cut Pro, Premiere or Avid. 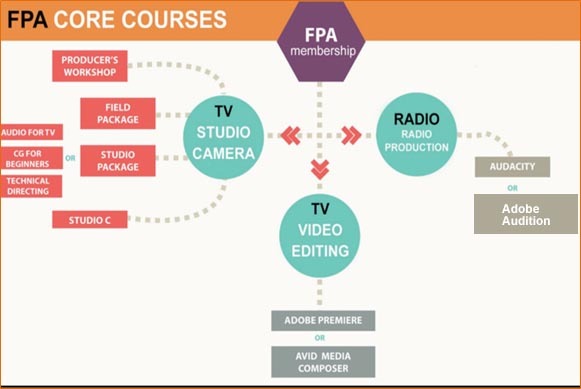 Are you looking to become a certified FPA Studio Producer? If you have prior experience and wish to quickly be certified in the use of our equipment, then this opportunity is for you. Our proficiency test consists of a hands-on studio equipment test and a short written exam. Note: FPA has a separate tests; one test for Studios A & B, and a separate test for Studio C. Students must select which one to complete. Schedule test by appointment with the Training Department. Are you looking to become a certified FPA Field Producer? If you have prior experience and wish to quickly be certified in the use of our equipment then this opportunity is for you. Our proficiency test consists of a hands-on Field equipment test and a short written exam. Schedule test by appointment with Training Dept. Are you looking to become a certified FPA Radio Producer? If you have prior experience and wish to quickly be certified in the use of our equipment then this opportunity is for you. Our proficiency test consists of a hands-on radio studio equipment test and a short written exam. Students with prior video editing experience can register to be tested on our non-linear editing equipment (our computer lab is currently set up with, Premiere CC and Avid Media Composer 8). Once certified, you will be allowed to use our Edit 1 lab computers to work on your FPA show or other projects that will air at our station.